Were you ever in a situation where you ran out of your ammunition, needed more, but there wasn’t a gun store that was open or it was too far away from you? Or, do you sometimes have the feeling the ammo you bought, simply isn’t as powerful as it should be, and that it was badly loaded? This is why you want the best reloading press you can find. 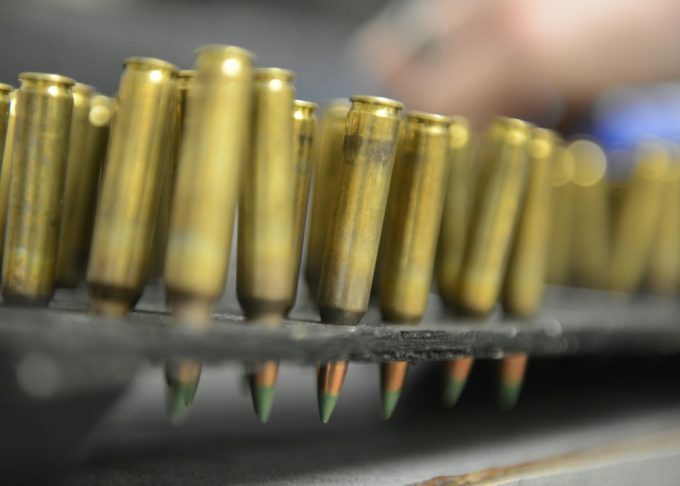 The ability to manufacture your own ammo, not only saves you money, but can also be a rewarding and relaxing hobby, full of new things to learn, with a clear progression path. 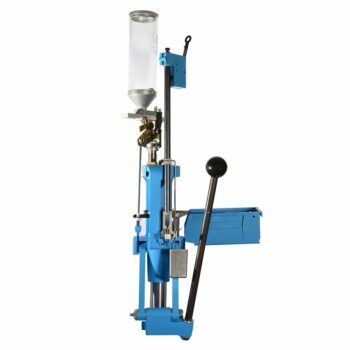 But, even for those in the know, choosing the right reloading press can be a bit of a minefield to navigate because there are so many different presses to choose from. This is why we decided to help and make your search shorter and much easier. In this article, we set some clear guidelines that can aid you in your choice. 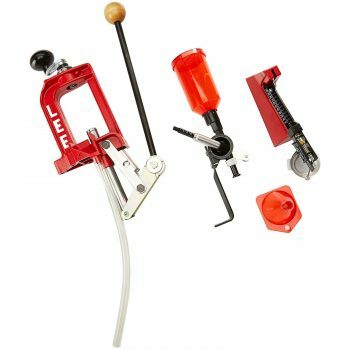 We also have a selection of six high-quality presses and kits available on the market, that we’ve looked into in a little more detail, and reviewed to help you on your journey in the world of reloading. It’s important for you to know what you’re getting and what you’re actually looking for. After all, there are plenty of options out there. So take a look at the features we thing you should check out first and see how they work for you. The first thing to look at is whether you want to use a single die or multiple dies at one time. Multiple dies are going to speed up your process because you need more than one to get a good product. With a single stage press you’re only going to have one at a time, but the turret or progressive press will give you more at the same time. It’s important that you look at how you’re going to work and whether you work best with everything happening together or if you’re looking to slow things down. Whichever press you have, you’ll easily be able to get going with one die or with more. If you’re looking for something that’s going to work quickly you may want to look at a turret or progressive press rather than a single press. They’re going to give you faster results because of those multiple die working in one system at the same time. Speed isn’t always the most important factor, however, because you’re also going to want to balance this out with the other features and the level of quality that you can expect. If you can’t keep up at a fast speed you may want to check other options too. It’s important to look at just how easy your system is to set up. 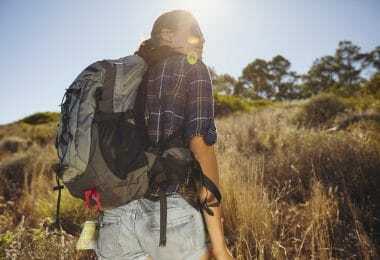 You want something you can get going as quickly as possible so you can get to the fun part, and that may not always be as easy to find as you might think. Look for a higher quality system to get you the ease you need. Also, make sure that you don’t jump on the first option you find that looks like it will be simple. Too simple, isn’t always going to be the best option and you want to make sure you have the best of the best at all times. Next, what kind of ammo are you going to make? Depending on whether you want to make something common or something more extensive, you’ll need to look at different options for your press. For example, a progressive press is best for more common options, while a turret press offers you more. A single press will even give you a wide range of options to provide you with choices on just what you’re going to make. That way, you’re going to have no problem getting the right ammo that you need to get back out there and start having some fun. If you’re like most people you probably don’t want to do a whole lot of case handling, and that means you need a press that’s going to help you cut down on that. The progressive or turret options are going to give you a whole lot more of that. You should look at how much you’re going to get done and how much you will save by using a system that has less case handling. It will also help you to get a better quality product than you’ll find otherwise. 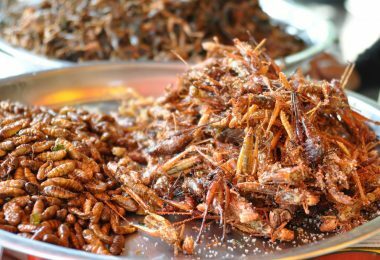 You’re definitely going to want one of the best options out there and that’s going to be any of the six that we have for you here. These will get you the absolute best ammo you’re going to find and make it a whole lot easier, faster and more fun to head out. Description: Due to the low entry, the Lee Precision Anniversary Challenger Kit II is a good option for anyone out there who would like to get into reloading, but isn’t sure they will enjoy it, and is perhaps a bit wary of investing too much into a hobby they may not continue. The kit is well built, and with proper care and attention, it will last for many good years. 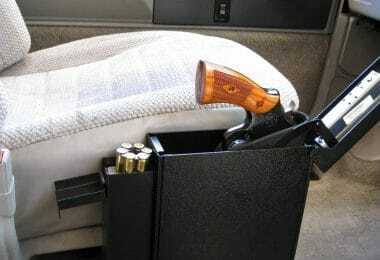 It comes with everything you need to start reloading, except the dies and cartridge components. For anyone really looking to get going, however, this is something that may wear out for you over a shorter period of time. For the hobbyist looking to take their time and build up, this is a fantastic kit, and many people find themselves upgrading and adding to the kit within a couple of months or so. It’s definitely going to get you started and gives you everything you need in order to jumpstart your passion or pique your interest. Related: Some new dies can be great to go along with your reloading press because they make sure that you can get just the right ammo. The Lee Precision 9-mm Luger 3-Die Set gives you three pieces to get you going again. 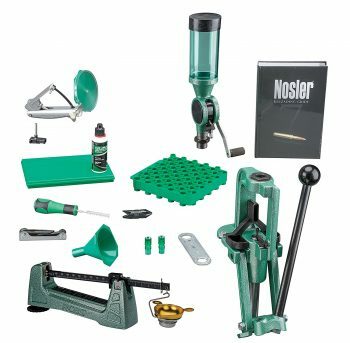 Description: The RCBS Supreme Master Kit can be great for beginners as it does provide you with pretty much everything you need to get going with reloading, though the dies will need to be bought separately. 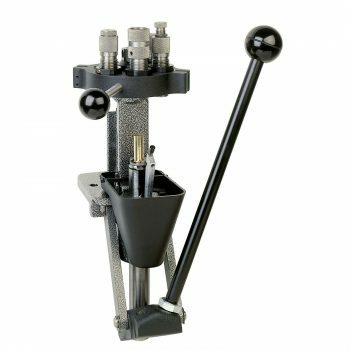 The Rock Chucker has a reputation for being well built and of good quality, so, after the initial set up, this is a kit that will last you for a long time, and will continue to make consistently high-quality rounds. You’re going to get a supreme press that uses plenty of cartridge designs and works with users that are right or left handed. It also has a mechanical scale, hand priming tools and a uniflow powder measure. You will need a few more pieces, but you’re definitely going to have a great start. This is a great choice if you’ve never tried reloading before or even if you’ve tried it a couple times but want to make sure you’re getting the hang of it right. You’ll have the instructions and information that you need. Related: One thing this kit doesn’t come with is a shell holder so the RCBS Shell Holder is a must have. 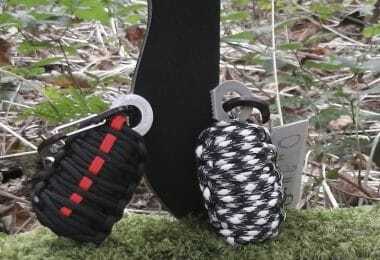 It makes loading your ammo a breeze and makes sure you’re going to be ready to go. Description: The Lyman T-Mag Reloading Press is fantastic for any reloader looking to progress from a single stage press and increase their output while decreasing handling time. It works very smoothly and with a little bit of setting up you can complete a round without touching the case again until it’s done. The ability to set up to 6 dies in the turret head allows countless options, and with additional turret heads, rounds of varying calibers are easy and quick to produce, with minimal changes. The kit comes with everything you will need, besides the dies and the primer feed tubes which will need to be bought separately. You’ll be able to finish a round in as little as 20 seconds and won’t have to worry about quality over an extended period. Lyman is well known for what they do and they definitely give you a great amount of everything for your money. Related: You’re going to want the Lyman T-Mag Extra Turret to finish out your set and make sure that you have plenty to get the ammo that you’re looking for and that you need. This turret creates a more precise setup. Description: The Lee Precision Classic Turret Press Kit provides near everything you will need – dies are not included – to consistently produce decent rounds. For hand gun and small rifle rounds, the kit equipment is ideal, the pro-auto drum powder measure and riser makes the job easy, and is largely accurate. Larger rounds are also possible, and a trimming tool is included for this purpose. In fact the press is very versatile, and the option to purchase additional turrets means you can, in theory, put the dies in once, and still produce several different calibers. For beginners looking to produce a lot of rounds quickly, this is also a great way to get a feel for reloading, as you can see the powder drop, feel the crimping and the primer being pressed. Even though several aspects of the process are still manual, such as the priming, putting the bullet head on etc., it is still possible to pump out 200+ rounds in an hour without breaking a sweat. Related: If you’re going to be making your own ammo you need the Lee Precision Auto Prime Shell Holders, which will help you with anything you want to make. You’ll be able to get great quality in no time at all. Description: The Dillon Precision RL550B Reloading Machine is a fantastic press if you’re looking to easily and quickly produce large amounts of ammo. 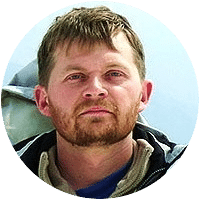 The initial setup can be completed in as little time as an hour if the guide is followed, and also help from YouTube is never far away. Most of the work is done for you on the four stations, and while the Dillon website may claim that it takes only one pull of the handle to knock out a round, there is slightly more to it. But not much. The press is capable of working on four rounds at a time, each station serving a different purpose, and will automatically fit the primer, drop the powder and crimp and secure the bullet. This tool is going to provide you with the bullets you want no matter what style they may be and no matter how much experience you have with this type of tool. It makes the entire process a whole lot easier and makes sure that you are ready to go. Related: You’re going to need some dies and the Dillon Precision 9mm Three Die Set here are a great choice to get you started. You’ll be able to start making your own ammo in no time at all. 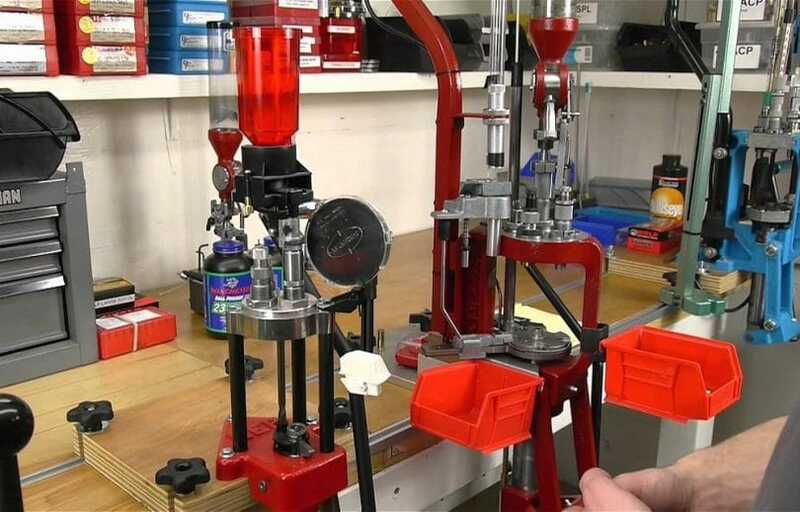 Description: The Hornady Lock-N-Load Reloading Press is most suitable for those who shoot a lot and require large amounts of cartridges regularly. With its ease of use and rapid production, it’s a fantastic piece of kit, and the five stations, as opposed to the more common four, allow for easy use of additional or specialty dies, for example, powder check or bullet seating dies, and cut down on pre-case prep. The EZ-ject system replaces the more traditional wire methods and allows far more productivity, no more messing around helping a quarter of your cartridges out of the station, or avoiding the ones that fly out! The powder measure is consistent and accurate, but be aware as it can be prone to spilling, and on occasion miss the cartridge. Even a small amount of powder in the primer shuttle can cause jams, so vigilance is necessary. Spending a bit of time tweaking the setup, with the aid of the many YouTube videos out there, is well worth the effort, as it will avoid hours of frustration and spilt powder. Finally, the customer service helpline is top quality and issues are generally resolved quickly and painlessly, with replacement parts shipped out speedily. Related: You’re going to need the Hornady Lock N Load Shell Plate to go along with this system and make sure that you can get your ammo just right. This plate is going to help you on your process and keep you going strong. With the Hornady Reloading Press, we have reached the end of our article. Now that you have read the entire piece, you have a much better insight into the topic, and know which details and features to keep an eye on, so that you are sure that the product you pick,is exactly matching both your needs and your skill levels. Speaking of skill levels, you have noticed that our reviews started with models for beginners, and slowly went to those who are experienced in this field. Therefore, make sure the press you want to order is the press you can handle. 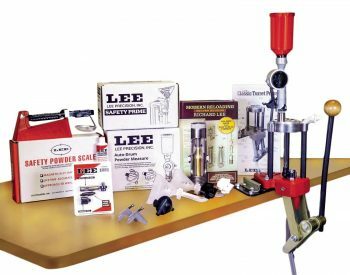 For example, if you are new to the world of reloading your own ammo, we recommend getting the Lee Precision Anniversary Challenger Kit as it comes with used guidelines for the entire process. 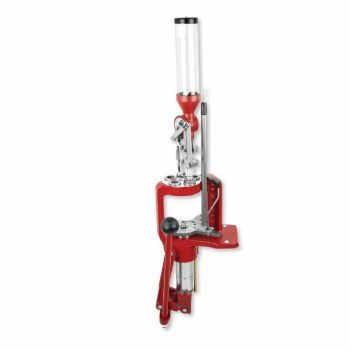 On the other hand, if you are looking for a model that will “spit out” huge amount of ammo in short time, and this is not your first rodeo, we recommend the Hornady Lock’N’Load Press. Do you have another feature that you think we should look at? Do you have one of these presses and want to tell us all about it? Do you have a different press and think it should be on our list? We want to hear all about it in the comments section below.